North County outdoor enthusiasts have a new reason to rejoice: Coastal Outfitters, an outdoor-equipment store north of the grade, opened its doors close to a year ago. Now, with feet firmly planted, the shop wants to be your source for hard-to-find items, special orders, and the cutting edge in outdoor equipment. Owner James Crow, an Alaska native, has been adventuring in California for decades, has seen the evolution of products, and has made the long drive over the grade from Atascadero to get the necessary equipment for his journeys. With Coastal Outfitters, he hopes to provide an alternative to shopping out of town but his interest in opening the shop wasn't purely capital. 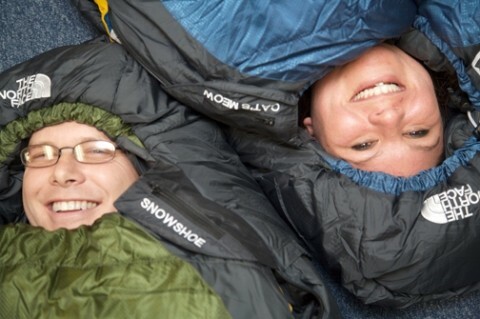 HAPPY CAMPERS: Coastal Outfitters owner James Crow and manager Christina Williams want to equip you to brave the great outdoors. "I've been climbing and camping all my life," Crow explained. "This was just something that was kind of fun." The two-person staff has a passion for the products they carry and the lifestyles they support. Modern camping supplies certainly require instruction, and manager Christina Williams knows the goods inside and out. Coastal Outfitters is practically building a business on good customer service and attention to detail. Many of the products they carry come from a running list of customers' needs at the front of the store. And for most major products such as backpacks, camelbacks, and water filters they offer replacement parts and accessories. Coastal Outfitters carries the standard backpacks and sleeping bags in styles, sizes, and prices to fit anyone even kids. Williams has worked closely with Boy Scout groups on hiking trips and demonstrations of the latest in outdoor technology, such as a water purifier that boils four cups of water in two minutes. The shop carries several models of backpacks that adjust to fit youths through several seasons as well as some fun stuff, such as light-up Frisbees. Coastal Outfitters carries outdoor wear from Isis a company of women designing clothes for women which features lightweight, durable clothes in fun colors and prints made to fit curves. The clothes come with inspirational messages in the pockets and help to support women in business. The Isis line exemplifies Coastal Outfitters' variety and level of specialization in outdoor products. Descriptions like "lightweight," "compact," "micro fiber," and "multi-use" attach themselves to an infinite number of products, from socks to food. Camping, it seems, is no longer really "roughing it." Shoppers can find lightweight meals to suit all tastes, from chicken with mashed potatoes to vegetarian lasagna. Most meals take about eight minutes to cook and even if it's not like what Mom makes, it still beats granola and ramen noodles. Hunters have been particularly interested in self-heating meals. Completely self-contained, they add a new level of convenience to camping. If you've got a sweet tooth, try dehydrated ice cream. It tastes just like the stuff you're used to it even melts in your mouth but it's warm. Top it with dehydrated strawberries or cherries, and you won't even miss your own kitchen. If you're just getting started adventuring in the area, or you want to go further, browse the library and map selection. Coastal Outfitters specializes in books detailing trails and camps on the Central Coast and all of California. For more experienced trailblazers, the shop offers USGS topographic maps for Central California. This holiday season, if you have a camper, hunter, backpacker, hiker, or general outdoor enthusiast on your list, try a practical gift pack. Prices range from $40 to $100 and contain quality products that your loved ones actually want. Coastal Outfitters is located at 5632 El Camino Real in Atascadero. For more informationon hours, products, and special orders, call 461-1361. For the second year, Dr. Kathleen Ledesma and Drs. Karim Rasheed and Javad Sani of the Sani Eye Center in Nipomo will be collecting nonperishable donations for the Food Bank of SLO through the holiday season. Patients can bring an item to their appointments and receive a $5 discount off their exam or eyewear. For more information about Sani Eye Center, call 239-4900. For more information about the Food Bank of SLO or how to donate, call 238-4664. Sierra Vista Hospital just celebrated the reopening of All Spice Cafe, specializing in healthy vegetarian and meat options, without trans-fat oils. To hear more about its menus and hours, call 546-7665. Third time's the charm for Mesa Cafe & Coffee Co. The Halcyon coffee house has reopened for breakfast with homemade pastries and a full lunch menu and daily specials. Mesa Cafe is open seven days a week. For more information, call 489-3900.